1. Poach the salmon in boiling water for 5 minutes. 2. Meanwhile, place the couscous and cumin in a small bowl. Pour over the stock, cover and leave for 5 minutes, then fluff up with a fork. 3. 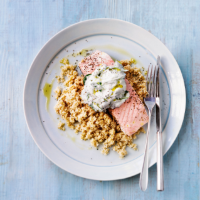 Mix together the yogurt, cucumber and watercress, then season and serve with the salmon and couscous.